This is an extremely rare multiple plate of fossil crinoids from the famous Mississippian layers near Crawfordsville, Indiana. There are SEVEN crinoids on this plate, of THREE different types! 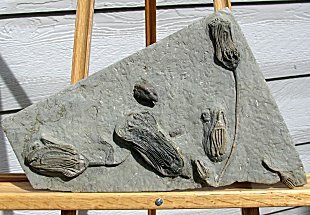 The three largest crinoids on the plate are Paradichocrinus polydactylus. These crinoids are rare as singles, and ULTRA RARE with three on one plate! All three examples have some stem intact, and one has a LONG length of stem preserved. All three Paradichocrinus are also extremely detailed. There are also three Macrocrinus mundulus, a Dichocrinus, and a Platyceras gastropod on the plate. The crinoids exhibit wonderful detail - the plate structure of the echinoderms is clearly defined. The fossils have outstanding color and contrast and are aesthetically displayed on the LARGE plate of siltstone. And best of all, the ''sea lilies'' are totally natural to the slab - they have not been composited. This is a very displayable and highly collectible Paradichocrinus crinoid plate from Indiana.